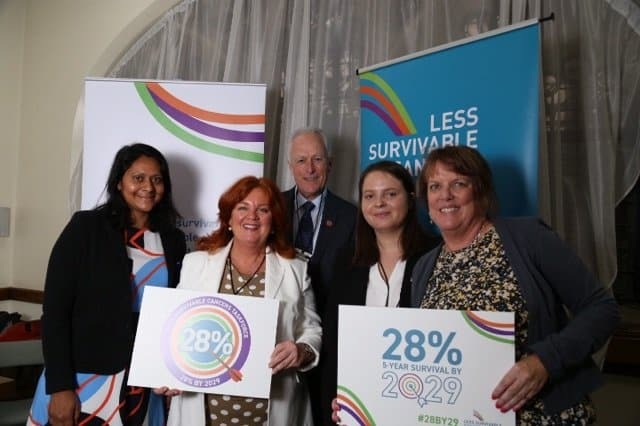 The Less Survivable Cancers Taskforce is a coalition of charities with a common goal – doubling the survivability of the six least survivable cancers in England by 2029. Patients diagnosed with lung, liver, brain, oesophageal, pancreatic, or stomach cancers have the worst outlooks of all cancer diagnoses in the country, with decades of underfunding and neglect resulting in these diseases being extremely under-researched, and their prognoses remaining poor. These cancers make up 27% of annual diagnoses, yet they are collectively responsible for around 50% of annual cancer deaths. Plus, they receive around five times less research funding, and half the amount of clinical trials annually, compared to more survivable cancers; like breast cancer. The current collective five-year survival of the less survivable cancers grouped together stands at just 14% in England. The Taskforce have set their ambition to seeing that double to 28% by 2029, as well as having this included as a formal target within the renewed NHS 10-year plan. This could be achieved through measures such as improving screening, reducing diagnostic delays, streamlined care pathways, improved access to the best treatment and investing more in research. With this in mind, on September 5th 2018 we launched our #28by29 campaign. That morning, Chair of the Less Survivable Cancers Taskforce Anna Jewell appeared on Sky News, alongside Steve Metcalf, a Guts UK ambassador living with stage 4 oesophageal cancer, to talk about #28by29. Diagnosed six years ago, Steve has never allowed himself to be set back and continues to live life to the fullest, completing an epic 100 mile cycle ride throughout London and the surrounding areas in July this year. He’s been incredibly fortunate, but very much the exception to the rule – we want to see stories of patients live Steve become the rule, rather than the exception. Already off to a strong start, we held high hopes for our Parliamentary drop-in the next day. Drop-in events like ours are held by a variety of organisations, all pushing their individual agendas, they used as an important means of engaging with MPs and educate them on important issues they may be otherwise unaware of. The Taskforce made strong connections in Parliament that day – and secured the ongoing support of George Howarth MP and Nick Thomas-Symonds MP, who went on to table parliamentary questions on our behalf to the Department of Health and Social Care. The drop-in event was also attended by Elaine Joscelyne, and her daughters Dannielle and Sophie, Guts UK ambassadors. Elaine lost her husband Keith just six weeks after his stomach cancer diagnosis, so they were glad to have the opportunity to speak to MPs about how big a difference a survival rate of 28% by 2029 would make to them. Having made an impact in the House of Commons, it was time for the Taskforce to meet with NHS England to make the case for less survivable cancers featuring in the NHS Plan. The consensus in the room was that being diagnosed with a less survivable cancer can result in healthcare professionals writing off a person and not offering them the support or treatment options that they want – which is particularly devastating news for the patients involved. NHS England were highly engaged, hearing from cancer patients who offered their perspective on life with a less survivable cancer, and what Government could do to improve their outlook. We were able to explain the importance of including #28by29 as a formal target in the 10-year plan, the expansion of pathways to treatment, and ways to increase public awareness of less survivable cancers. We hope NHS England were listening and it will include us in their long-term plan for the NHS – but the battle still isn’t over yet. As time nears before the 10-year plan is published, we’ve had our campaign covered in The Telegraph, and secured an open letter published within The Sunday Times advocating for our 28% target – which was signed by 17 parliamentarians. We also delivered a petition with over 16,000 signatures to 10 Downing Street calling for the survival rate of the less survivable cancers to be doubled by 2029, and we’ve met with Mohammed Yasin, MP for Bedford, to discuss how Parliament can implement the change we are so desperately fighting for. There’s still a long way to go – but we’re excited for what the future holds. A patient with a less survivable cancer deserves to have the same opportunities for treatment and survival as any other cancer patient. All patients with a less survivable cancer should be able to lead a life as full and active as Steve Metcalf, and we believe that’s something worth fighting for.